Finished size of quilt is 27" x 27" or 27" x 33". Hand printed fat quarter comes in natural or white. Printed with black ink. Quilt can be made in two different sizes. 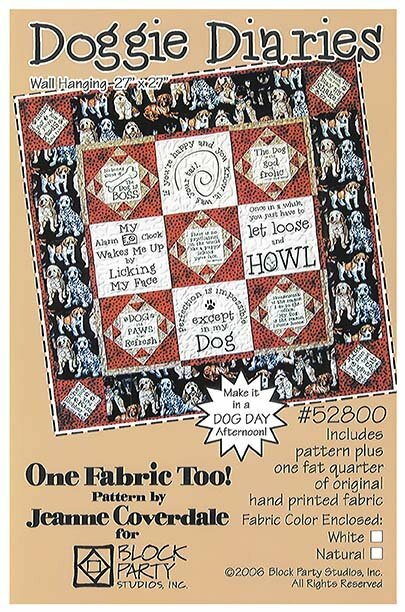 Version 1 uses nine squares of Doggie Diaries fabric panel (27" x 27") and Version 2 uses all squares of Doggie Diaries fabric Panel (27" x 33"). After purchasing this pattern, email sales@blockpartystudios.com to request a bonus pattern of foundation blocks for this project.